Denmoza is a South American genus consisting of one accepted species: D. rhodacantha. Another species has been described as D. erythrocephala, but it is generally not accepted as a “good” species. The species grows in Argentina in the region of Mendoza, of which the genus name is an anagram. Brownish-red-spined (normal) form of D. rhodacantha in bud. In habitat there are specimens reaching heights of up to 3 meters according to Hunt et.al. in The New Cactus Lexicon. However, the “normal” description of D. rhodacantha calls for a species globular in shape, only elongating towards a slight columnar shape in old age. The plants I have are probably around 25 years old and very much globular at approximately 15-20 cm in diameter and about the same in height. Close-up of the flower. The stamens produce a great amount of pollen that is very easily shaken loose, which could possibly suggest the flowers are wind pollinated in habitat. 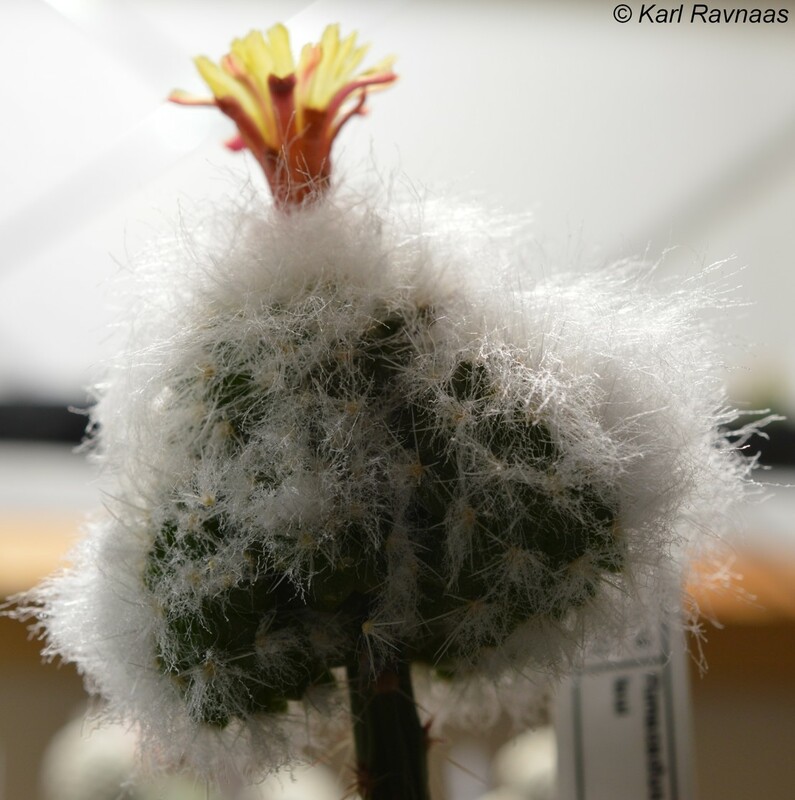 Described in 1922 by Britton and Rose, the genus Denmoza has later been included both in Cleistocactus and Oreocereus. 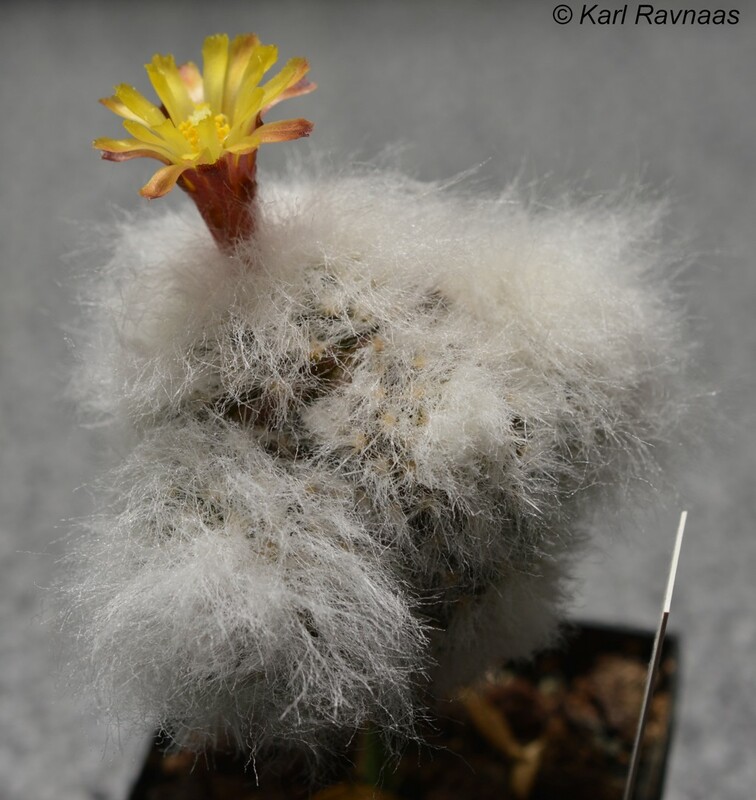 As can be seen from the flowers on these plants and the specimen of Oreocereus trollii described in a previous post, there are some clear similarities. 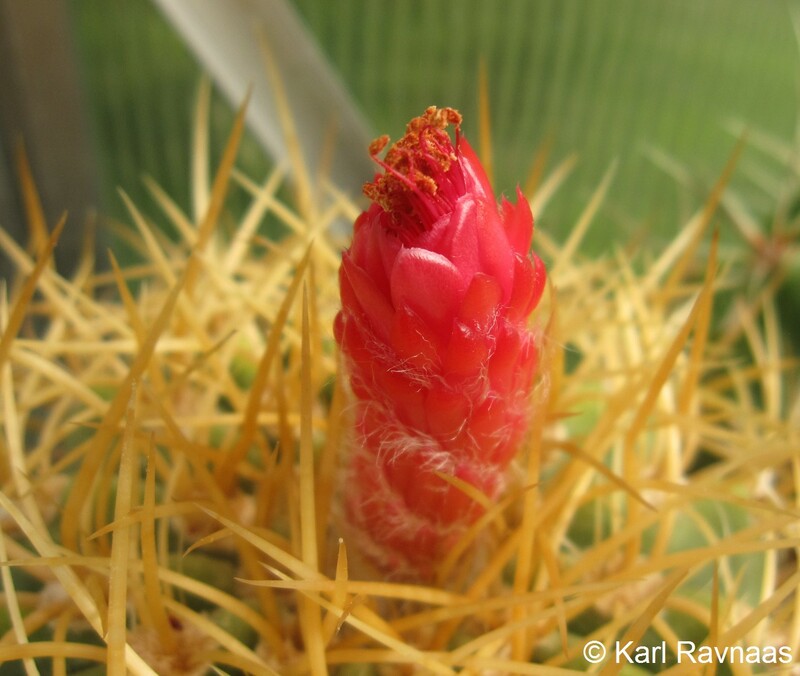 Some more recent research suggests the genus is more closely related to the genus Acanthocalycium and certain members of Echinopsis s.s. (“sensu stricto”, as in the strict or narrow view of Echinopsis). It is also possible that it arose in the distant past as an intergeneric hybrid between Echinopsis and Oreocereus, as suggested in J. Lodé’s The Taxonomy of the Cactaceae. The usual descriptions of the species calls for brownish red spines, which certainly doesn’t fit the yellow-spined form I have. The spines on that particular specimen are also slightly stronger than on the brownish-red-spined form. I think they are both very attractive forms and although they take a long time to start flowering (probably at least 15-20 years), they are well worth growing. Here the stamens and pistil are just emerging. The yellow-spined form is particularly handsome, especially when contrasted with the attractive red of the flowers. I cross-pollinated the two plants as they happened to flower at the same time and intend to sow some of the seeds that resulted from the happy union. I certainly hope the yellow-spined form will show up in some of the seedlings. It is quite easy to grow and fairly tolerant of adverse conditions. It’s hardy down to at least -5°C and probably a good deal more for short periods. A well-drained porous soil with perhaps 30% organic material will give good healthy specimens. This species was discovered in 1971 by Alfred Lau, in a location south of Tocopilla, Chile. It took some time before it was officially described because it shares many characteristics with both Copiapoa and Eriosyce s.l. (s.l. meaning “sensu lato”, as in the expanded view of that genus), while at the same time possessing many particular characteristics other members of those genera do not. 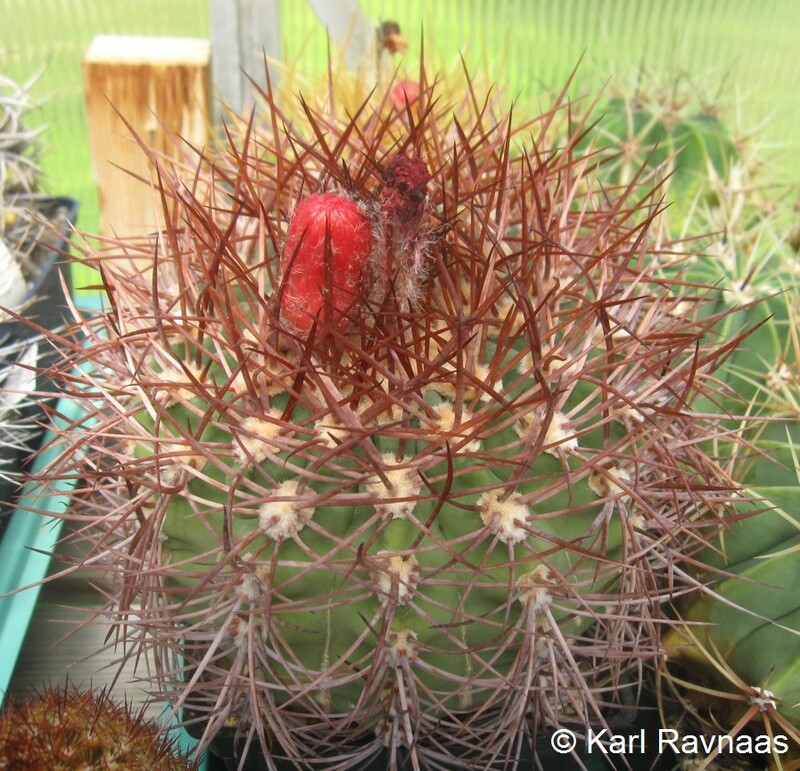 In the nineties it was included in the genus Eriosyce s.l., although some felt it belonged in Copiapoa, while others felt the genus Islaya (included in the sensu lato version of Eriosyce) was the best fit. 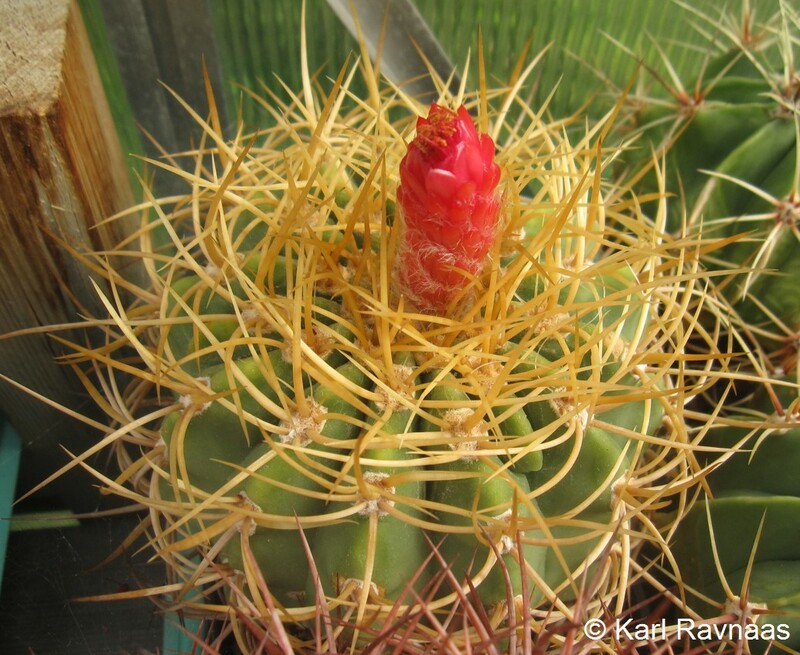 Roy Mottram felt the species was too distinct to belong in Eriosyce, and erected the genus Rimacactus for it in 2001. Later phylogenetic molecular studies have shown this to be the most correct option, as the species is not closely related to Eriosyce. The same studies show that it is most closely related to Yavia (another monotypic genus) and Neowerdermannia (a genus with two species). 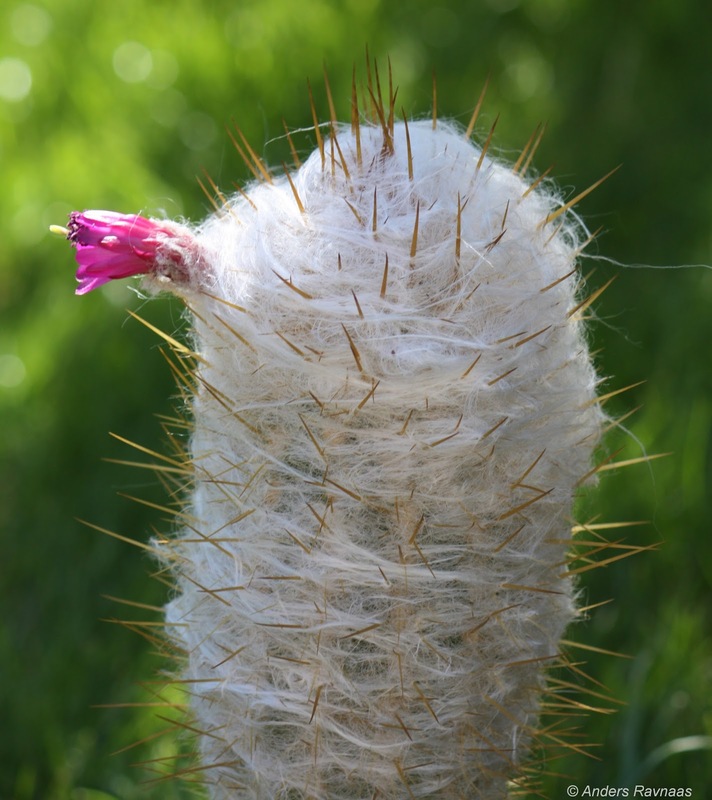 It is an attractive species with white needle like spines on a greenish-brown body, and with copious amounts of wool. There is, however, a very great difference between plants in habitat and grafted plants in cultivation. The plant is often grafted because it is fairly difficult on its own roots, being particularly vulnerable to overwatering. The upside of grafting is that it flowers easily and willingly, while also developing a lot of attractive wool. On the other hand it does not particularly resemble habitat plants when grafted. Here you can see the root stock clearly. The plant is around 5 cm in diameter. I sowed some 10 seeds 18 months ago and two germinated. They grew very slowly and as seeds of this species are usually quite rare I decided to graft the two seedlings in order to try and produce seeds of my own in the future. Only one of the grafts were successful however, but in exchange it has grown very well and has now flowered just a little over a year after being grafted. The stock plant is Pereskiopsis diguetii which is an excellent stock plant for seedlings and will greatly accelerate growth. The petals are a nice shade of yellow, while the sepals contrast well with an attractive brownish-red colour. The flowers last a good deal longer than in most cacti. The flowers also contrast nicely with all the white wool. In habitat the plant will probably not grow much bigger than this, and will not develop as much wool. I am going to sow more seeds of this species soon and try to grow them on their own roots. The species will probably do best in a completely inorganic mixture with somewhat infrequent watering. 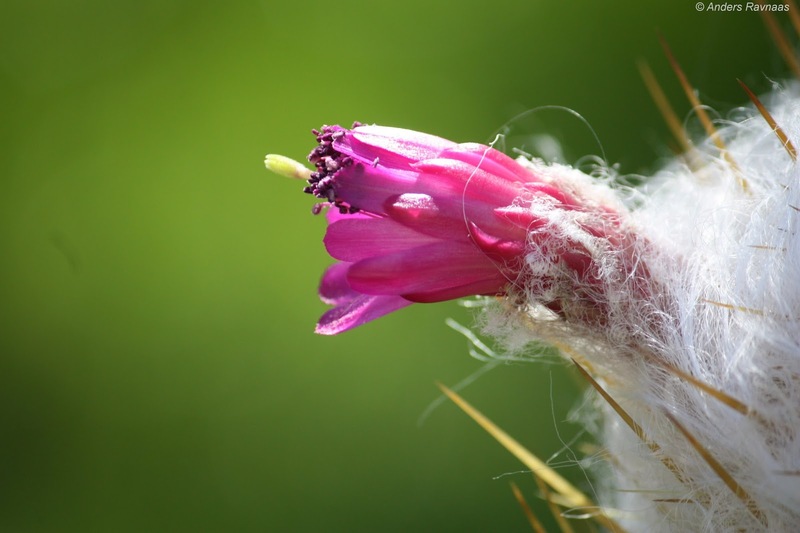 Just a couple of weeks ago I noticed a bud developing on an Oreocereus trollii in the greenhouse. It’s always a little extra exciting when columnar species flower because they usually take quite a lot longer to reach flowering age than the globular ones, and this species had never flowered before. I sadly missed the show, though my father was there to document it. I’m not quite sure how old it is, though I’d venture a guess at around 15-20 years perhaps, and it’s probably around 25 cm tall. 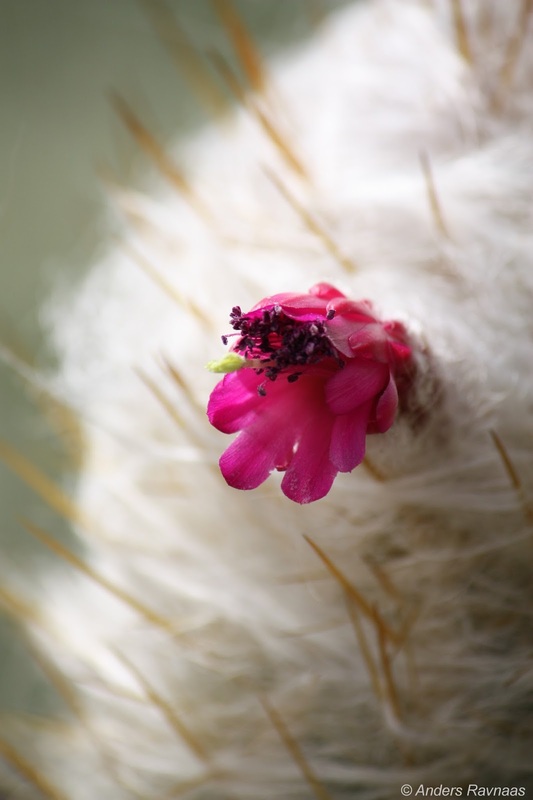 Oreocereus are found in the Andes of Peru, Bolivia, Chile and Argentina at altitudes between ca. 1000 – 4000 m a.s.l. O. trollii is found in southern Bolivia and northern Argentina at around 4000 m a.s.l. The great amount of hair on the plant is there to protect it against wind and cold. This particular species doesn’t become any taller than between 50-100 cm. 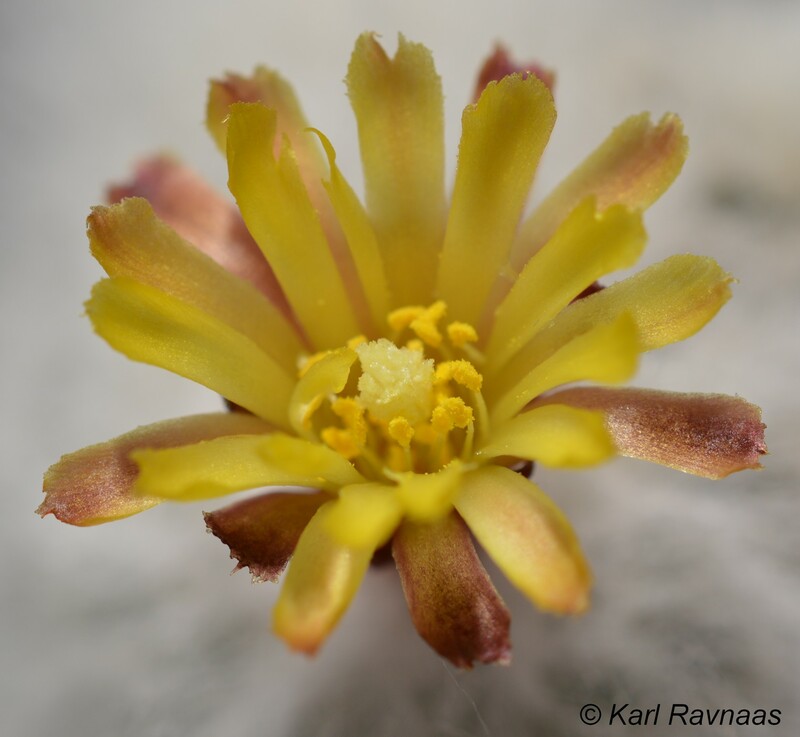 It’s a testament to the adaptability of cacti that this species can thrive and flower at sea level in Norway (almost 60°N) when its habitat is near 20°S at 4000 m a.s.l. in the Andes, approximately 11 000 km away! 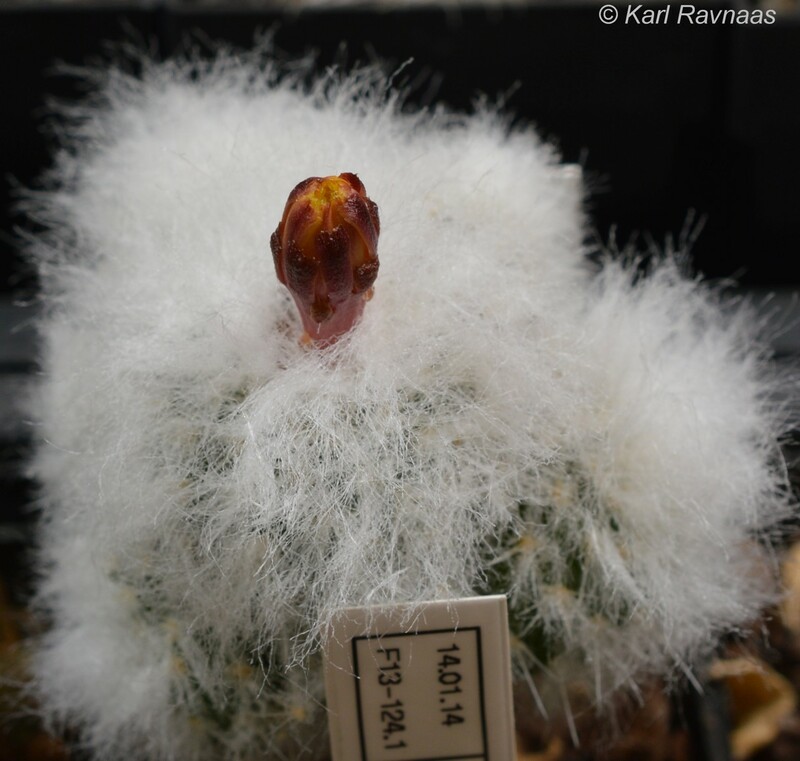 Oreocereus trollii with its first flower. Close-up of the flower. I quite like the purple anthers. Another close-up of the flower. 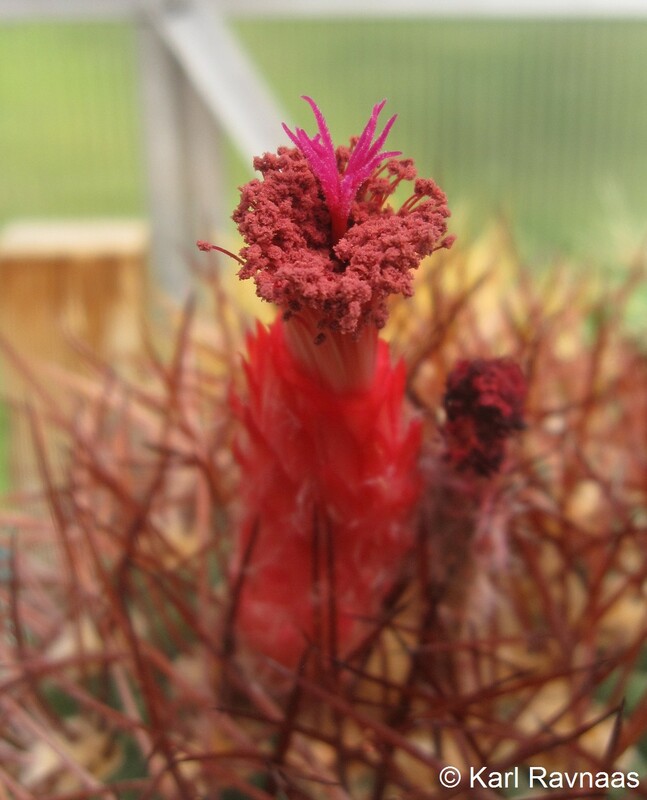 The combination of the flower colour, the yellow spines and the white hairs is quite attractive.